Transit operations generate massive amounts of data, from AVL systems, ticketing systems and more. While these are used for reporting, mainly to analyze On Time Performance, this data can be further visualized and analyzed to deliver valuable operational insights. These insights, in turn, become valuable operational improvements for planners and schedulers. Understand on-time performance percentage across all your schedule – from the entire schedule and down to the single timepoint. 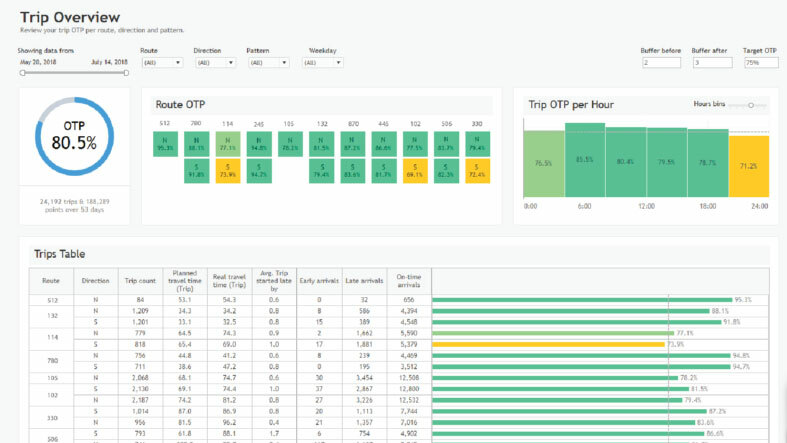 Optibus analytics doesn’t just show your current state – it can also generate travel time adjustments that will support your On Time Performance goals. You can download new travel times and begin your planning cycle with accurate data and a high likelihood of on-time performance success.